Early this morning I gathered a variety of plants to create a formal arrangement, but time seems to be evaporating today, so I will save that idea for another time. Instead I am sharing a loosely arranged design that practically assembled itself when I was placing the flowers in water for conditioning. The main focal flowers are sprigs of blue, fuzzy-headed Conoclinium coelestinum and stems of vermilion-hued Chrysanthemum. 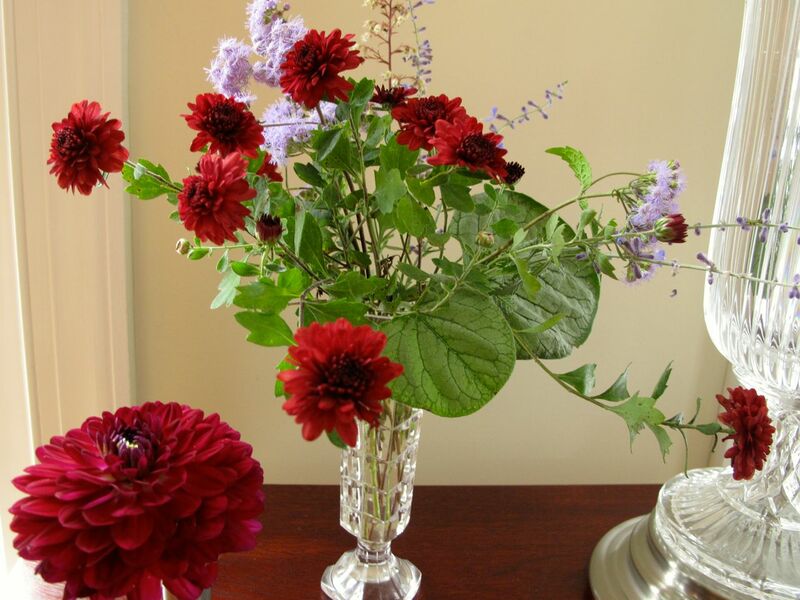 Off to one side sits a scarlet Dahlia ‘Blue Bell’ flower in a small pewter vase. The strong colors seem appropriate for early autumn. Conoclinium coelestinum, also known as Blue Mistflower or Hardy Ageratum, is native to eastern United States and attracts butterflies to the garden. It has been blooming for several weeks and should continue well into fall. 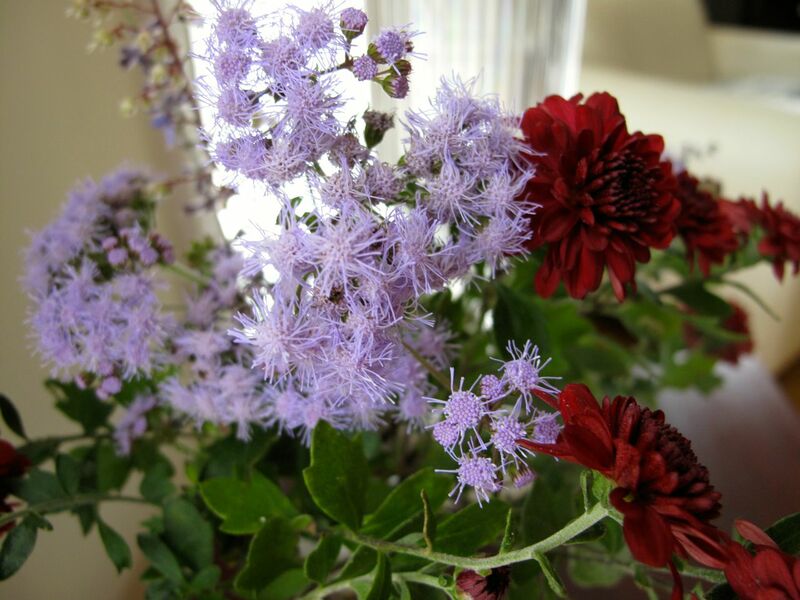 The Blue Mistflower and the Chrysanthemum come back reliably every year without any attention. A couple of leaves from Brunnera macrophylla ‘Silver Heart’ add a heart-shaped foliage accent. Several stems of Perovskia atriplicifolia extend loosely outward, repeating the color of the Blue Mistflower. A slender, flowering stalk of Heuchera villosa ‘Big Top Bronze’ (Coral Bells) added a vertical element to the vase. Both containers used in today’s arrangement are special treasures received many years ago. The little pewter vase was a bridesmaid’s gift from a college friend and is engraved with the date of her wedding. The footed, cut glass vase originally held a sunshiny bouquet of daffodils, a spring token from another friend. The vases are extremely versatile and I have reached for them over and over again to hold small to medium-sized flowers. 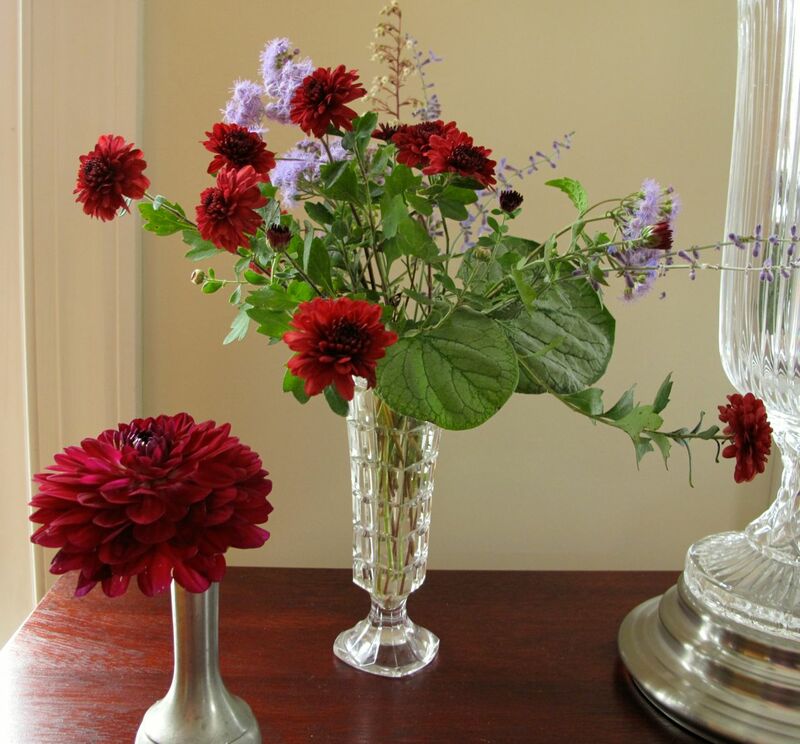 This entry was posted in garden and tagged chrysanthemum, Conoclinium coelestinum (Blue Mistflower, Dahlia 'Blue Bell', flower arranging, flower design, garden photography, Hardy Ageratum) on September 29, 2014 by pbmgarden.